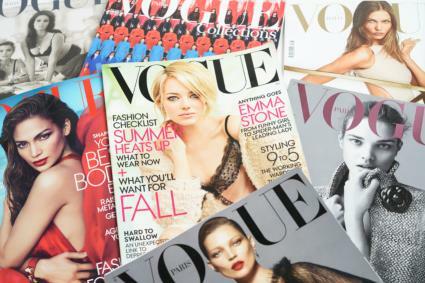 Vogue is fashion's bible, the world's leading fashion publication. It was founded in 1892 as a weekly periodical focused on society and fashion, and was subscribed to by New York's elite. Condé Nast (1873-1942) bought the magazine in 1909 and began to transform it into a powerhouse. Vogue delivered beautifully presented, authoritative content under the leadership and watchful eyes of a few talented editors-in-chief. One of the most notable, Edna Woolman Chase, became editor in 1914 and remained at its helm for thirty-eight years, until 1952. Caroline Seebohm, Nast's biographer, credits Chase with introducing new American talents to the fashion audience. Chase gave full coverage to European, and especially Parisian, fashions, but her approach also suggested that American women might exercise a certain independence of taste. Chase's successor, Jessica Daves, served as editor in chief from 1952 to 1963 and is remembered primarily for her business acumen. She was followed by the flamboyant Diana Vreeland, whose eight-year tenure (1963- 1971) documented "Youthquake," street-influenced youth fashions, and space age and psychedelic fashions. Vreeland's successor was her colleague Grace Mirabella, who served as editor-in-chief from 1971 to 1988. Mirabella was the antithesis of Vreeland; her watchwords for fashion were functionality and affordability. Whereas Vreeland wrote in 1970, "In the evening we go east of the sun and west of the moon-we enter the world of fantasy," Mirabella countered, in 1971, "When you come to evening this year, you do not come to another planet." Mirabella approached the "antifashion" 1970s with a levelheaded stance that addressed a growing constituency of the magazine: the working woman. Anna Wintour became editor-in-chief of the magazine in 1988 and combined a shrewd and appealing mix of high and low. Her first cover for the magazine, in November 1988, featured model Michaela in a jeweled Lacroix jacket-worn with blue jeans. Nast's original "formula" for Vogue was based on service, which Seebohm translates as disseminating fashion information to his readers as efficiently and clearly as possible. Clarity did not exclude creativity, and the magazine became well known for its own stylish look. Vogue's most famous art and creative directors were M. F. (Mehmed Fehney) Agha, who started at Vogue in 1929, and Alexander Liberman, who joined the staff in 1941. The magazine has employed the foremost illustrators and photographers of its times. (The first photographic cover appeared in 1932; color printing was introduced in the following year.) Its glossy pages maintain the highest standards for the visual presentation of fashion. Vogue is still the stuff that many dreams are made of. See also Fashion Editors; Diana Vreeland. Chase, Edna Woolman, and Ilka Chase. Always in Vogue. New York: Doubleday and Company, 1954. Daves, Jessica. Ready-Made Miracle. New York: G. P. Putnam's Sons, 1967. Dwight, Eleanor. Diana Vreeland. New York: William Morrow and Company, 2002. Mirabella, Grace. In and Out of Vogue: A Memoir. New York: Doubleday and Company, 1995. Seebohm, Caroline. The Man Who Was Vogue: The Life and Times of Condé Nast. New York: Viking Penguin, 1962.